St. John Ambulance hope to raise awareness for parents and carers of the risks of choking and how to help a baby/child if they choke. I think all parents and carers should know the basics of First Aid just in case something does happen such as choking. 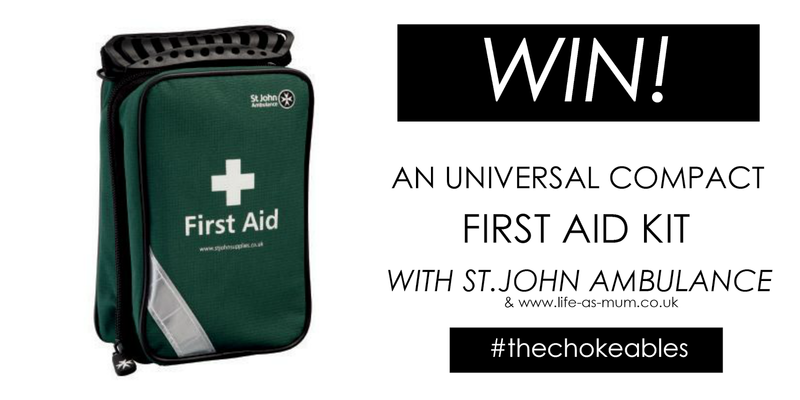 Over 40% of parents told St. John Ambulance that they have witnessed their child choke but they quizzed the parents on First Aid, four-fifths of them don't know what to do in the situation. St. John Ambulance have done a short 40 second video which include voices of celebrities such as David Walliams, Johnny Vegas, Sir John Hurt and David Mitchell. They each voice an object than can potentially choke a child such as - a pen lid, peanut, jelly baby and a small princess toy. This video send a strong message and could help and save a life. One of my readers can win one universal compact first aid kit from St.John Ambulance. If you would like to win one, all you have to do is enter the Rafflecopter below, but please read the boring but important T&C's before entering! Yes, I have attended a first aid training course several times. I have four children so feel I should know. Luckily my children have never cholked on anything yet! Unfortunately not, although I am hoping to go on a first aid training course soon. I'm not sure - i have done first aid training but dont know if i would remember at the time! Yes, I work with children so attend regular first aid courses. No, I would panic. I have booked myself on a first aid course!! I have to attend first aid training every 2 years so yes i would. Yes I have an idea but not sure I'd feel 100% certain in a real emergency. Great question, the answer is no. My wife is pregnant with our first child, so would be very useful to know so will look into taking a first aid course. No, I would probably just panic so I really need to look at educating myself. I've seen the video before and can remember what to do thank goodness!! Yes, just hope I never need to put it into practice. Yes... I just hope I never have to use that information! Yes as my husband has first aid training so would know what to do if our darling daughter started to choke God forbid that should ever happen! No I wouldn't know. I hope it never happens! Yes actually saved my child from choking. Never been on a first aid course though. Have followed on Twitter @Welsh34. Made typing error.